Having seen The Avengers, I’m backtracking to the source movies. The first Iron Man was clever; the second near incomprehensible. Thor was above average. The Hulk movies will have to wait, be it the Ang Lee Hulk movie starring Eric Bana or the later version with Edward Norton. I still can’t get over how, if you have a mutation that makes you really big, your pants expand as well. They didn’t do that in Watchmen. Moving on. 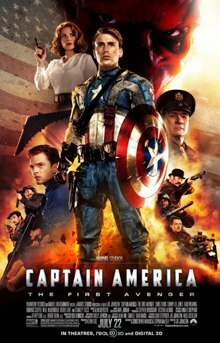 Captain America tells the story of a rail thin kid (Chris Evans) whose had plenty of sand kicked in his face. All he wants to do is go to Germany and fight Nazis, which is particularly pressing because one Nazi (Hugo Weaving) is fooling around with the supernatural to become even stronger and more diabolical than Hitler (see Raiders of the Lost Ark, Hellboy). Stanley Tucci, the German-American doctor who sees the gentility in Evans, puts him in a machine and soon, Evans is buff and ready to take on Nazis. He has an inexplicable British gal minder, Hayley Atwell, and a gruff regular army foil, Tommy Lee Jones. All characters are boring and stock, particularly Evans, who has the face and demeanor of soft butter. A lot of stuff happens after his transformation, but full disclosure – we turned it off after an hour.